"He’s doing everything possible," the surly, veteran hurler bemused Thursday morning. "I don’t think he’s said no to anything. He’s enjoying himself for sure." John Lackey is getting up there in baseball years and may not be long yet for this league; however, he's made it distinctly clear that he won't be ponying up for a grand retirement tour when his time comes. Instead, as he told the Chicago Tribune, when the writing is on the wall, he "just won't show up the next year." In other words, exactly the opposite of what beloved Grampa Rossy did and is continuing to do so far in 2017. Well, I never said it was a Cubs uniform, did I? Grampa Rossy's World Tour hit Tallahassee, FL earlier this week, where he donned an iconic uniform of a slightly different shade of blue. That's right, laced up his Jordan's to hit the hardwood with the famed Harlem Globetrotters, where he gave a preview of his sweet dance moves and "contributed" two points on a layup to the Trotter cause. I think we can all agree that it's a darn good thing that the Washington Generals (or whatever poor saps they play these days) don't *ahem* play to win. For such a monumental, cross-sport cameo, I felt that a commemorative trading card needed to be drawn up, so I immediately set to work on a template. 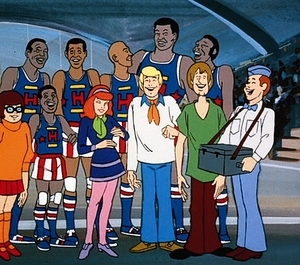 For a beloved franchise that's been around for over 90 years, played in approximately 26,000 contests and even had it's own animated television show , there sure aren't many cards featuring the team of "Sweet Georgia Brown." Fleer put out a set in the early 70's and there's been a few one-offs and oddballs found in breakfast cereal and/ or other products; on top of the slim pickings, the designs were quite basic and not much more than a picture with a white border. Where's the fun in recreating that? At last, I had found my muse. Although they make use of posed shots in front of simple, brightly-colored backgrounds, the design of these SGA panels evoke memories of 70's Topps. It's something about the nameplate; I can't quite put my finger on it. It's not just me that sees this connection, right? 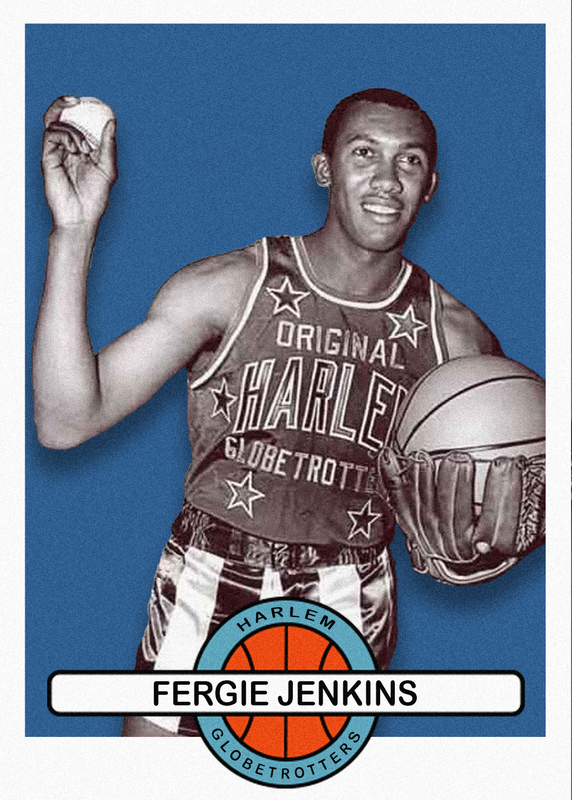 That's right, Hall of Fame pitcher Ferguson Jenkins spent a couple of off-seasons (1967-69) as a full-time member of the touring show. With that in mind, you darn well better believe that I wasn't going to create this template and not mock up a Fergie card too. I'd have to turn in my Cubs blogger badge if I didn't include the Northsider's greatest pitcher, in the modern era. This wasn't just a publicity stunt either - Jenkins could hoop. In fact, good ol' Fergie was just a phenomenal athlete, all the way around, also starring in track & field and ice hockey during his high school days. During off days, it wasn't uncommon for Fergie to lace up his skates and practice with Bobby Hull and the Blackhawks, where he'd capably hold his own. Before I go, as I alluded to earlier in this post, it's a crying shame that this iconic team doesn't have more of a cardboard presence. 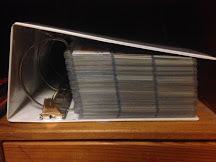 According to my calculations, while there were a smattering of GT card sets released in the 70's and 80's, there hasn't been a single one produced since 1998. 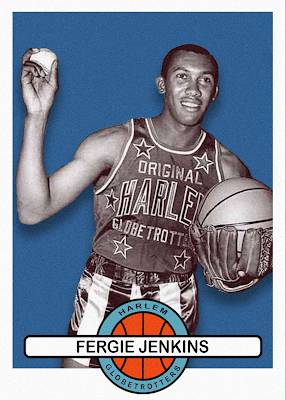 Thankfully, there have been token appearances in Panini basketball products to ease the vacancy, but not many. I'm not a die-hard basketball card collector, but I would eat something like that up - the Globetrotters have always held a special place in my heart. In fact, the last sporting event I had the honor of attending with my grandfather (the one who bequeathed his Cubs fandom to me) was a Trotter show at the United Center in 1997. 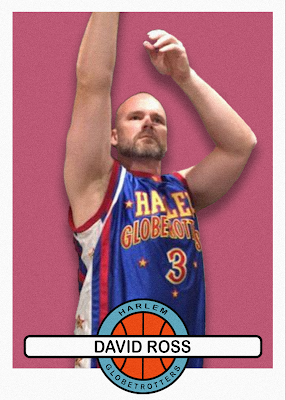 Anyway, that's the story of how I ended up making a pair of Harlem Globetrotter custom cards in my precious spare time. I wonder where the Grampa Rossy Retirement tour will pop up next? Nice! I had been meaning to make a custom with that great Fergie photo one of these days myself. Thanks for posting the Ross video. I hadn't seen that one yet. Grandpa Rossy sure is having fun in retirement! Nice customs. I don't collect basketball anymore... but if I started up again... 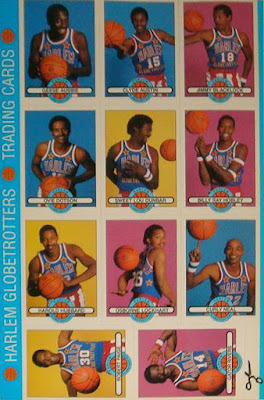 I might track down some of those 70's Globetrotters cards.